What's more feminine and flirty then a powder pink vest and a white feathered skirt? This is one of my favorite looks that I've pulled together in a long time. I picked this vest up at Banana Republic on sale (with an extra 50% off! ), I walked the store about ta thousand times before actually making the purchase. And I'm glad that I did! I must say though the icing on top was these Emma Winston crawler floating earrings. These earrings a delicate yet bold. I adore that these in particular had a earcuff feel to them and can be worn multiple ways (I love multi-purpose anything!). And in true FNYG style, here styles are affordable for these stunning and unique pieces of jewelry (starting from $70 to about $200). And you can now enter to win your own pair of earrings! 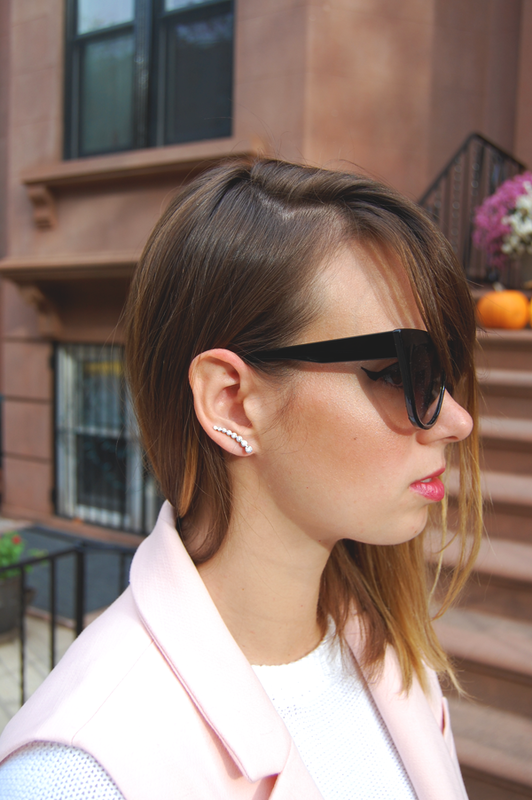 Emma Winston New York is giving away A Free Pair of Floating Earrings, a pair of Studs, and 2 $25 gift cards to 4 lucky fashionistas! such a pretty look! love your pink vest! I love all the pretty and feminine textures going on here! and um, pretty sure I need those shoes! I have the black version of that vest ;) hehe Super cute, girlie look!